Much has been written about bacon. So much that all the directions for doing it are very easy to find. Go YouTube, Google or numerous Facebook groups dedicated only for bacon, loads of information is readily available. I have eaten home made bacon and it is fantastic. Today, I decided to start mastering this delicacy. All recipes I could find, emphasized how simple it would be. Cure it, smoke it and eat it. Straight forward! However, when diving deeper into secrets and details of curing the meat, things suddenly got complex. As a first timer, I was left puzzled on who to believe. 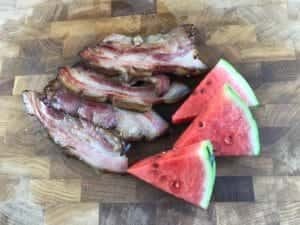 I would agree that smoking pork belly is simple. This I have done many times. But as it turns to bacon only by proper curing, how to go forward? Reading through articles I learned about different methods for curing, cautions for botulism as a cause of death, guidance for using sodium nitrite (E250) for preventing botulism but at the same time cautions for sodium nitrite as a cause of death! And I thought this should be fun! Well, I decided to rely on guidance given by Finnish Food Safety Authority (EVIRA) and European Food Safety Authority (EFSA). As per “Regulation (EC) No 1333/2008 of the European parliament and of the council of 16 December 2008 on food additives.”, “Maximum amount off added Sodium Nitrite to meat products is 150mg/kg”. Can’t argue with that! To be on the safe side and not to overdose, I went with 100mg/kg. 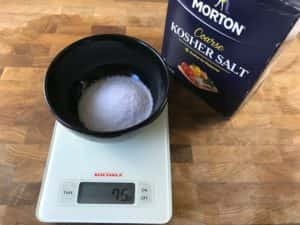 With my Sodium Nitrite Salt 0,6%, that meant 17g/kg. I had 3,5lb (1,6kg) Mangalitza Pork Belly in a freezer, just waiting for this moment. 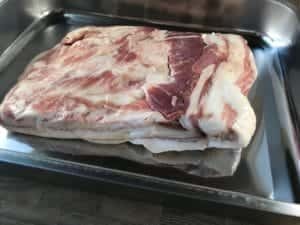 I mixed all ingredients well together and then rubbed it evenly on both sides of the pork belly. 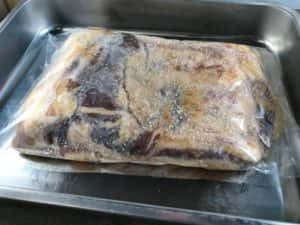 Next, I placed my pork belly into a resealable plastic bag and back to the fridge for seven (7) days. Every day I turned the bag once over. The cure will draw moisture out from pork and some liquid will appear on the bottom of the plastic bag. Turning it over helps in redistributing liquid. After seven days, I took the pork belly out and rinsed it well with cold water. Then patted dry with paper towel and placed on a cooling rack in a steel pan and put back into a fridge again. 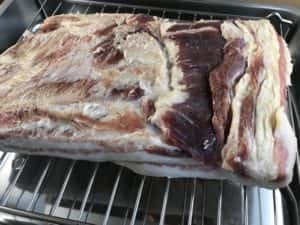 I let the pork belly dry in fridge overnight. Next day was a big day for smoking the pork belly! I ignited charcoals in my Monolith Kamado and let the temperature rise to 225°F (110°C). Then placed pork belly directly on the grill grate on top of indirect heat. I added good handful of apple wood chips directly on hot charcoals and closed the lid. After 90 minutes internal temp of the pork belly was 150°F (66°C). I took it out again on the cooling rack and let it cool down to room temperature. Then wrapped in plastic and foil and put back to fridge for a night. Plastic wrap goes first as salty bacon might react with aluminum foil. Next day was even a bigger day. I opened up the package and beautiful bacon smell filled the kitchen quickly. I sliced four 1/3 inch slices and placed them on hot Monolith kamado plancha for searing. Few minutes searing for both sides gave my bacon slices nice color. Then it was time to taste it. I enjoyed all bacon slices selfishly by myself with few slices of fresh water melon. This is great combination of salt, fat and fruit. Even when homemade bacon takes more than a week to process, it not so complex after all. It takes time, but most of the time is waiting. 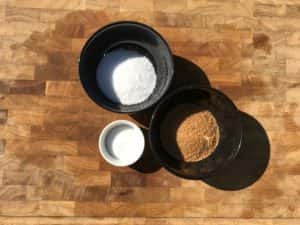 Curing was the biggest question for me, but now I have researched it and documented well in this article. Next time will be even smoother. Mangalitsa pork is superb. This pork belly was from Joutsin Tila but there are number of local breeders in Finland. I am also sure any pork belly will make excellent bacon but then again, I claim Mangalitza takes it one step further.